Bisons men's volleyball senior Dustin Spiring waves to the Bisons faithful in his final home game for Manitoba. The 28th edition of the Duckworth Challenge belongs to the University of Winnipeg Wesmen. Each year the Duckworth Challenge pits the U of M and U of W against each other in a best-of-five series. The U of M Bisons went into the week’s action up 1-0 against the Wesmen but lost three straight to give Winnipeg the title. In the first Duckworth match of the year, the Bisons women’s soccer team came away with a 1-0 win over Winnipeg in a game at IGF. A slow start sank the herd Thursday in a 79-60 loss to the Wesmen, tying the Duckworth Challenge at 1-1. Faith Hezekiah dropped 24 points in a monster performance for the Wesmen, while no Bisons player cracked double digits. Winnipeg built a 17-6 lead in the first quarter before Manitoba got the engine going, but the Bisons were still outscored 10-9 the rest of the way, ending the quarter down 27-15. The second quarter was little better, as the Bisons were held to 11 points for a 44-26 Wesmen lead at half-time. Winnipeg kept Manitoba at arms-length the rest of the way, and took the game. In the second game Thursday night, Sean Tarver walked all over the herd in a 97-75 loss. Tarver had a game-high 30 points for Winnipeg while Keiran Zziwa stayed hot with 18 points for Manitoba. A strong 26-17 opening quarter got the Wesmen off to a running start, and 17 points by Tarver led Winnipeg to a 48-37 lead at half-time. Manitoba turned up the heat in the second half, twice cutting the Wesmen lead to nine. A Joel Adu-Quaye jumper got the herd within one, but Winnipeg went on an 11-point run before Malik Irwin knocked down a buzzer-beater to make it 67-57 Wesmen after three quarters. The Wesmen threw up 30 points in the final quarter to bury the Bisons and take a 2-1 lead in the Duckworth Challenge. The Wesmen finished off the Bisons Friday at Investors Group Athletic Centre with a 3-2 win in men’s volleyball to win the Duckworth Challenge. Kevin Negus was unstoppable for Manitoba with 27 kills, while Dustin Spiring had 14 kills and seven digs in his last Duckworth Challenge game. Negus’s hitting “was exceptional tonight,” said Bisons head coach Garth Pischke. Spiring started his final home game on a good note, slamming down four kills for the home side in the first set. 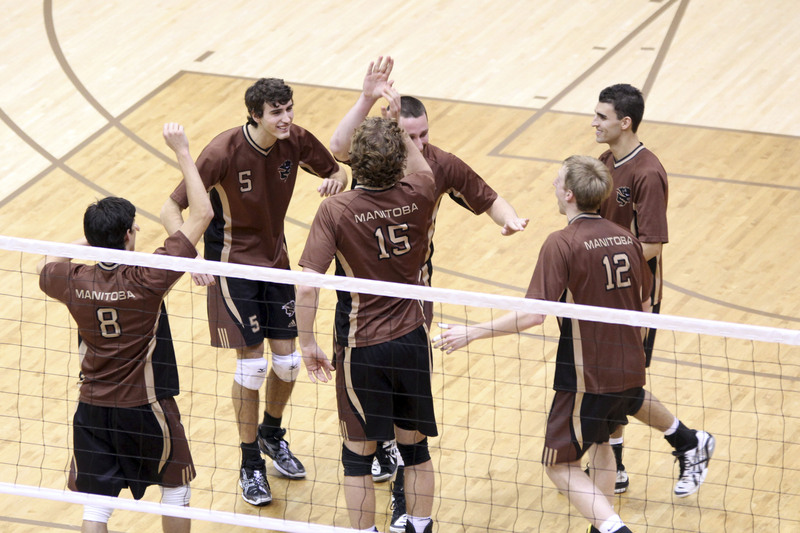 Manitoba led 20-17, but Winnipeg responded with eight consecutive points to win the set 25-20. Negus smacked down nine kills in the second set to lead Manitoba to a dominant 25-17 win, tying the match at 1-1. Winnipeg was up 15-11 early in the third set, but Manitoba responded with six straight points to take a 17-15 lead. Winnipeg did not go down and battled back to a 21-21 score, before a 4-1 Bisons scoring run gave the herd a 25-22 win. The Bisons led 17-15 in the fourth frame, but three consecutive points pushed the Wesmen in front by one. The two sides traded points until Winnipeg eked out a 25-23 win to force a fifth set. The cross-town rivals went blow-for-blow in the final set, until Adrian Dyck hammered one final ball to give Winnipeg the 15-12 victory. Spiring was presented with “Dusty” chants following his final home game in a Bisons uniform. He has been “a great leader and a real example to the rest of the student athletes across the country,” said Pischke. With the challenge already won, there was still one final game to be played Friday, as the Bisons swept the Wesmen 3-0 in women’s volleyball. Kearley Abbott led the herd with 15 kills, while Cassie Bujan had a game-high 20 digs. The Bisons “started off pretty rough but it shows how our team holds it together,” said Bujan. Winnipeg opened with six unanswered points, but Manitoba struck back with five consecutive points of its own. The teams went hit for hit for the remainder of the frame. The Wesmen led 30-29 when Abbott killed another game-tying ball, followed by a Tori Studler service ace to give Manitoba the 31-30 lead. Abbott smashed another ball for the 32-30 opening set win. Manitoba went on an early 5-0 run to take a 6-2 lead in the second frame, followed by another to go up 11-3. Winnipeg woke up and got within four at 18-14, but the Bisons powered down eight unanswered points for a 25-14 set win. Another early 5-0 run in the third set had Manitoba up 7-3 and they never looked back, as the herd won the set 25-19 to take the match. Following the game, Bujan talked about her final Duckworth Challenge. “I’ve grown up with these players and so have my teammates,” said Bujan.